Last week I left YMCA elated that YMCA Corinthians had beaten Payzone by two clear goals after being 3-0 behind at half time. This week no such glories, just a horrible deflated feeling after crashing to Lions. With a starting line up that included 4 of last weeks heroes I was secure in knowledge that at least team would be competitive. That said I was aware Lions had brought in Callum De-Gruchy, Loughborough University star used to playing in FA Super League matches. Then again Lions goalkeeper was not playing so maybe that should equal things out? How wrong could I be, Lions started on fire, Corinthians was on the back foot, five minutes in matters got worse as we lost Josh Carver-Mill to injury. Damage limitation was all I could hope for, and we did not do that to well. But, credit to team we did get a consolation goal. Final score? Please its about participating not the score. Ps: I should have mentioned this was best Lions team performance I have seen in the many years I have known them. It was futsal at its very best. 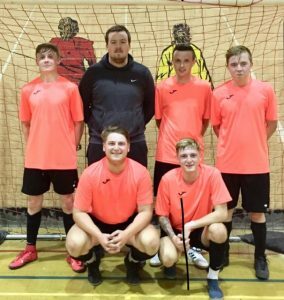 This entry was posted in Grimsby Futsal League, Kevin Bryant news updates on June 21, 2018 by Kevin Bryant.